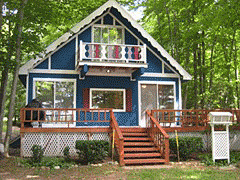 This beautiful three bedroom, one-and-a-half bath chalet overlooks Lake Louise in Johannesburg, Michigan with 70 feet of its own private beach frontage. Enjoy boating, fishing, swimming, or just relaxing during the summer months. We have the ability to accomodate up to ten people comfortably. And with thousands of acres of State Land and easy access to snowmobile trails nearby, this chalet makes a great hunting or snowmobiling camp as well.